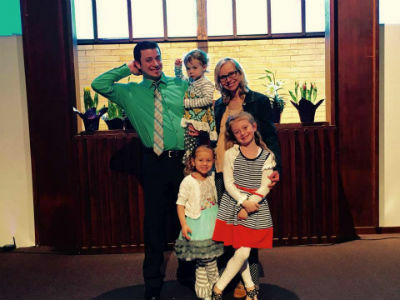 For two years, the two Church of God congregations of Ithaca, Michigan, have shared a youth pastor. The radical arrangement simply makes it possible for one to have a youth pastor, while the other church now has resources it didn’t have before. Ithaca Church of God and Edgewood Church of God have discovered that competition crumbles when it’s all about the common mission. That mission isn’t to outdo one another, see who can fill more pews, or beat each other to the buffet! While churches in America have been known to act like they’re on different teams, the truth is we’re on the same team when we seek God’s kingdom first. 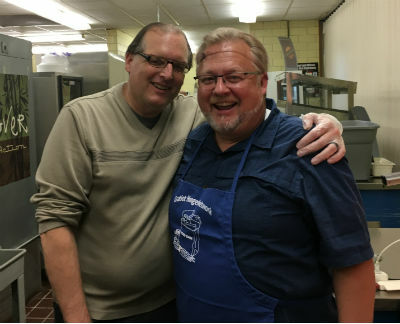 Not only do Ithaca and Edgewood share a youth pastor and various activities through the year, but they also team up with churches of a variety of denominations to meet the community’s needs. Perhaps that’s why the recent joint fundraiser for the local food pantry brought in record crowds and dollars. Ithaca Church of God was established just before 1920, and Edgewood, which is the longest-serving Church of God congregation in Michigan, was founded, in part by D. S. Warner, in 1882. Only eight miles separate the two churches. Because of the functional unity practiced by the two congregations, miles are about the only thing that come between them. Photo: Pastor Tom (left) & Pastor Dave (right). Photo: Potato bar, sponsored by the churches, at the high school. Unity must not be only theoretical; it must be lived out. Edgewood and Ithaca share more than youth ministry. They come together for a variety of ministry and mission opportunities through the year. One such event recently concluded with huge success and involved a potato bar fundraiser for the local food pantry. The pantry is a cross-denominational ministry of the churches of Ithaca. From Baptist to Presbyterian to Methodist, the churches work together to keep the pantry stocked and serving the needs of the community. Especially encouraging is that the two Church of God congregations spearheaded this event! Even the VBS program that Ithaca Church of God puts on is a combined effort between the Methodists and the Presbyterians. Jesus is the subject. This entry was posted in All Church of God, Great Lakes and tagged combine, David Perry, ecumenical, Edgewood Church of God, functional unity, Ithaca, Ithaca Church of God, Matt Derby, Michigan, partnership, potato bar, together, Tom Whitesel, unity, youth leader, youth ministry, youth pastor. Bookmark the permalink.